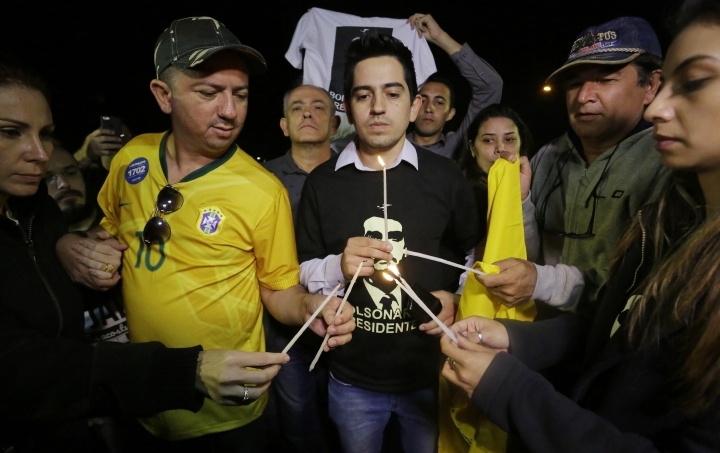 SAO PAULO — The man suspected of stabbing Brazilian presidential candidate Jair Bolsonaro was moved Saturday to a prison in the state of Mato Grosso do Sul. The Globo TV network said Adelio Bispo de Oliveira was taken to the Federal Prison in Campo Grande, the state's capital. It said he would be held in an isolation wing used for prisoners who might be in danger. Calls to the prison's administration went unanswered. Bolsonaro, a far-right congressman running second in opinion polls, was stabbed Thursday during a rally in Juiz de Fora, a city about 125 miles (200 kilometers) north of Rio de Janeiro. He suffered intestinal damage and serious internal bleeding before undergoing surgery at a local hospital. 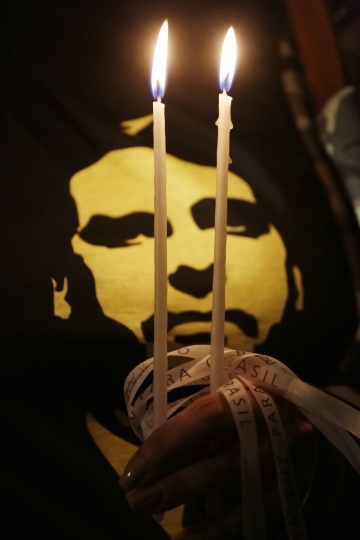 He was later transferred to Sao Paulo's Albert Einstein Hospital, where doctors said Saturday that he was improving. "My father continues improving and has begun physical therapy sessions," Flavio Bolsonaro, one of the candidate's sons, said on his Twitter account. He posted a photo showing his smiling father in a blue hospital gown sitting on a chair imitating pistols with both hands. It is unclear what led de Oliveira to attack Bolsonaro. The G1 news portal on Friday posted a cellphone video, apparently obtained from police, where he said he acted on God's orders. 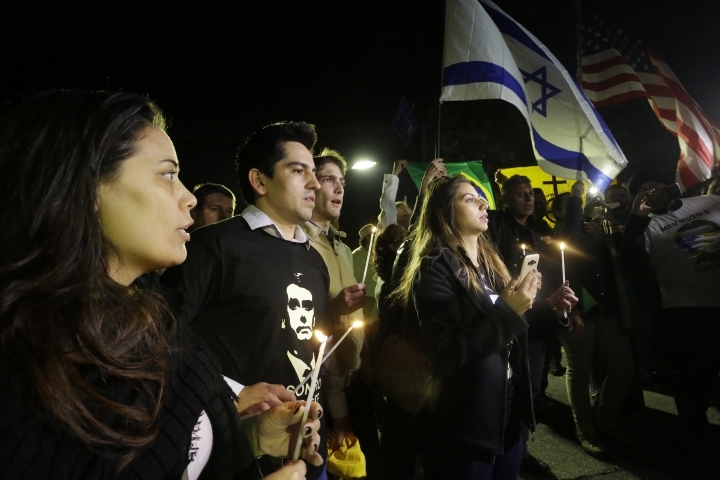 Although there is no indication that the stabbing was premeditated, the Bolsonaro camp has sought to pin the blame on the left. "They say that he (de Oliveira) was a lone wolf. That it was an isolated case. That is not the case," said Eduardo Bolsonaro, another son of the candidate. "At the very least he was a leftist with a lot of hate in his heart." Evangelical pastor Silas Malafaia said on Twitter that de Oliveira was once affiliated with the left-wing Socialism and Liberty Party, which like most of Brazil's political parties criticized the attack and called for a thorough investigation. 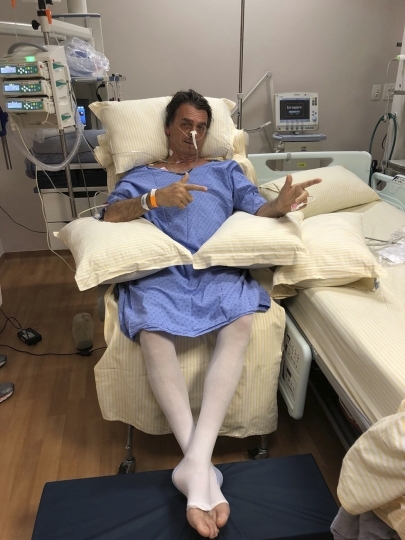 For Bolsonaro, there will be questions about his physical ability to campaign for the Oct. 7 election. "He probably won't go back to the streets during this campaign, so he can't do it, but we can," his son Flavio said in a video posted on Facebook. The son later tweeted: "Jair Bolsonaro is stronger than ever and ready to be elected President of Brazil in the 1st round. About a dozen candidates are competing in the presidential race. If no one wins an outright majority, the top two finishers will face off in a runoff election Oct. 28. The Federal Police said in a statement Saturday that the number of agents providing security for each candidate will be increased, though it provided no details. But Bazileu Margarido, an official in candidate Marina Silva's campaign, told G1 that the number of agents would rise to 25 from 21.